How Does A Bionizer Work? Pool ionisation is an effective way to sanitise pool water without the use of (harsh) chemicals. Many people in today's eco-conscious society prefer to swim in chlorine-free water for a variety of health and economical reasons. Chemical free swimming is also a safe and preferred solution for families who have children with allergies, eczema or asthma. NASA was the first to use ionisation for water treatment in the NASA Space Shuttle in the 1960's and Bionizer has refined and adapted this space technology for eco-friendly pool sanitisation. Pool and spa ionisation uses a safe, low level current that passes between two copper and silver anodes (electrodes). This current generates positive mineral ions which stay in the pool water where they “search and destroy” bacteria, virus and algae organisms, and remain on patrol guarding your pool and spa water from impurities. Why Ionisation and Why Bionizer? Once chlorine, salt and bromine were the only options available for pool sanitisation. Unlike chlorinated water, ionised pool water will not dry out your skin, or leave your skin smelling of chlorine. A Bionizer pool will not damage your bathing suits, bleach your hair or damage your pool covers. Our Bionizer system is eczema and asthma friendly and gives you the wonderful pleasure of swimming in drinking quality fresh water. Bionizer is a global expert and innovator in chemical free pool systems. It's new generation ioniser is microchip and software controlled – and outperforms all other pool systems. The Bionizer unit is unaffected by heat and (unlike salt) will not corrode your pool equipment or surrounds. 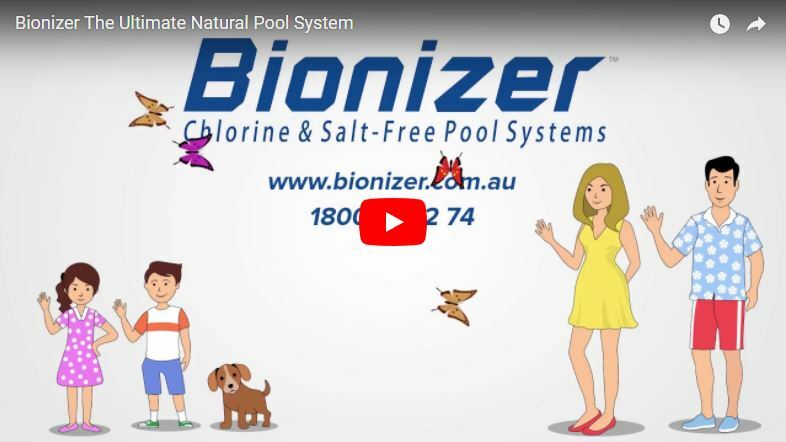 Bionizer brings over 17 years of industry experience to designing solutions for pools for pool and spa owners looking for chemical free, sophisticated, user-friendly pool purifying systems. All of our features come to you in a watertight compact enclosure that will have you wondering just how we packed it all into one small unit. However, with this compact design comes real power and robust construction. We offer a full five-year warranty (excluding sacrificial anodes). The Bionizer system comes with a 90-day unconditional money back guarantee, which is an industry first and highlights the confidence Bionizer has in its products. 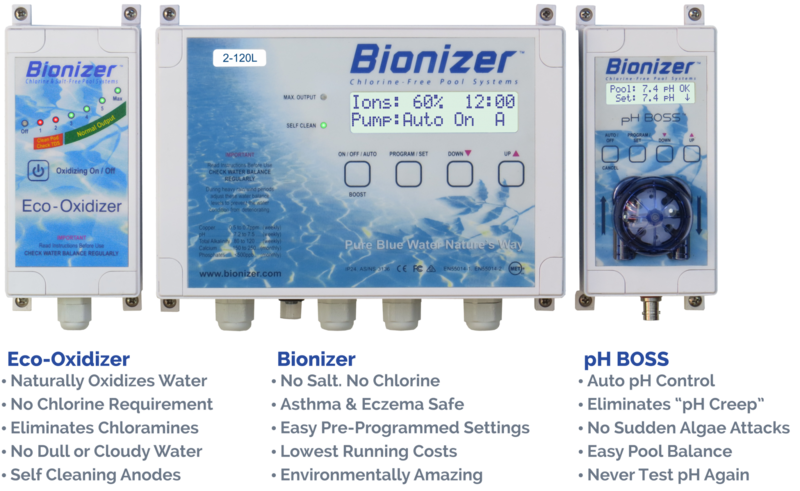 The new digital Bionizer has many powerful features that are NOT available on other pool and spa control systems. CLICK HERE TO VIEW BIONIZER'S FEATURES. 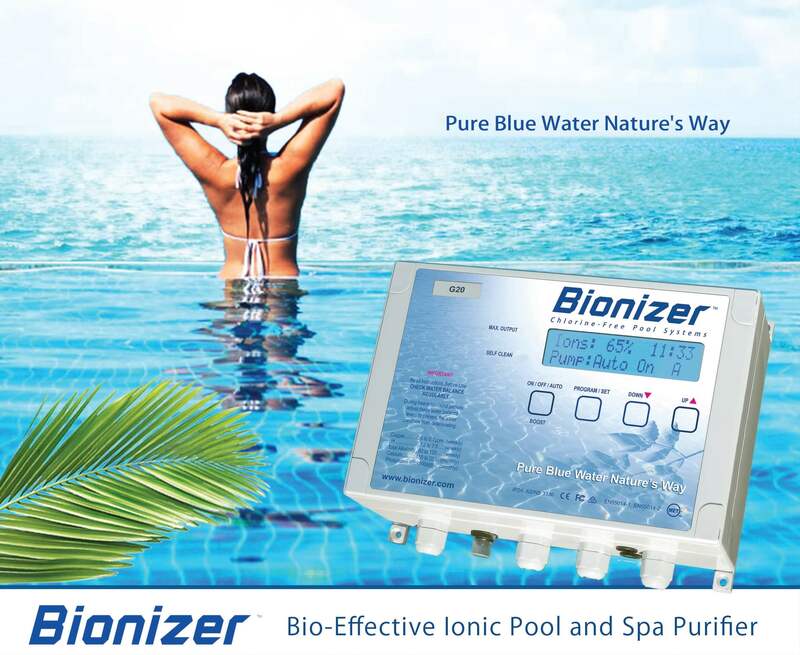 Bionizer is excited to showcase its ‘Three-In-One’ Eco Pool System which includes automated pH control, plus our exclusive NATURAL pool oxidizer. This sophisticated modular 3 in 1 set and forget system controls and times your pool pump and filter, while at the same automatically maintaining the water at a level of purity and clarity that will astound you.